"The new thing is never as good as the old thing, at least right now. Soon, the new thing will be better than the old will be. But if you wait until then it’s going to be too late." Read the entire article on Bookseller.com or follow TOC chatter on Twitter (#TOCFrankfurt). 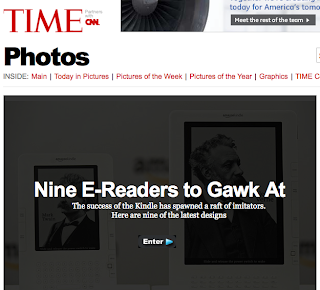 In related news, Time magazine has an interesting article about the evolution of the e-reader and current state of the e-reader industry (at least 17 are either in development or on the market worldwide, though Amazon's Kindle has been ahead of the game thus far), as well as a photo gallery of Kindle imitators currently on the market.